dosa | Three friends who love to cook! My fun assignment for today was making dosa. I was the dosa half of “Pancake meets Dosa”. I was all excited to start early, take pictures along the way and make it a step-by-step recipe. No such luck! Work, dear work, has a way of spoiling the fun. I did not let work zap all of the fun, but it definitely took its hefty share. In work’s defense though, work never called itself “fun”. Neither is its tag line “Where friends are made!”. I have to tell you though, as part of growing, learning and improving myself every day of my life, I am trying to learn to take these ups, downs and curve balls in stride and not let it ruin my whole day (which I would have previously!) Do I hear you mumble..”drama queen!!”!? Having said that, I made dosa. Dosa is one of my favorite eats, morning or noon. Notice, I never said “night”. Because that would be weird, plain weird I tell you! Or would it!? Hmmm….maybe dosa should join the dinner table as well! Dosa is the savory Eastern half of West’s pancakes. It’s origins can be found in South India. A dosa a day keeps the doctor away! Trust me on this. There are various types of dosas. they can be made from lentils, rice, semolina, pulses etc etc. I made mine from semolina today. It is a quick and easy recipe and lucky for me, my family’s favorite. You may wonder why I am not delving into the recipe with this post. Like I said before I ended up having to work, work, work and that meant very little time to cook. So I tossed measurements to the side, recipe to the side, pictures to the side and ended up making the dosa with a pinch of this and a dash of that. 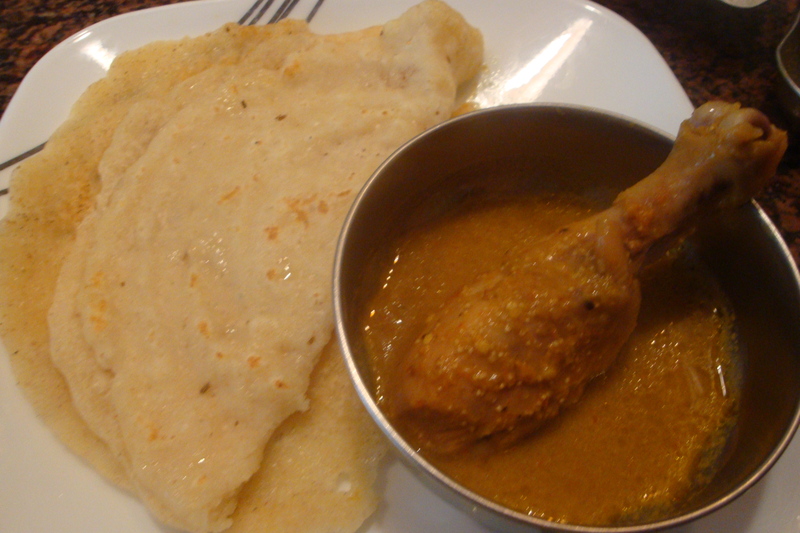 I served the dosa with chicken curry. Luckily for me, the family LOVED it. My husband loved it so much, he has asked me to make dosa my daily assignment. I have such a problem with measurements, knowing how much of what I am adding or what I am adding. And yet, I keep wondering why I cannot make progress on my cookbook. P.S: I will post a pic tomorrow. Time to shut down the laptop and get ready for the week. Monday update: Pic added. Hope all had a good Monday! My friends inspire me… they push me, motivate me, make me think. Friends define us maybe more than our family does. “You can’t choose your family but you do choose your friends.” Not sure who said that but it really does ring home with me. Radhika and I met less than a year ago online. Friends of friends from way back connecting through Facebook. I swore I would NEVER get involved with FB. One very close friend of mind had been pushing me to get on it for a while and I finally bit. Reconnecting with people from my past, choosing to become friends again with people I knew when I was young and finding out that we all have grown so much was great. And the icing on the cake has been meeting my long-lost friend Radhika. Radhika and I had never met, not in this lifetime anyway. We were instantly bonded through food and a love to create meals and memories for our families and friends. She pushed me into blogging with her… I say that with gratitude in my words because if my friends didn’t push me I would have less joy in my life! Our first topic was to be pancakes… my family LOVES breakfast for dinner as well as breakfast for breakfast. I suppose that we would love breakfast for lunch but I think that is actually called brunch. Rad is going to give you a GREAT recipe for Dosa, a lovely Indian “bread/pancake” that she has made for me on my visits. They are lovely and handmade. A real art to it. I hope she will post a video of the process as she looks very zen while cooking them. I make pancakes like most American born American’s… via a box. I was raised on that great staple called Bisquick. The box that launched a thousand meals. I dabbled with other mixes; fancy ones from William Sonoma, some southern box I picked up on a drive to Florida and a new actual favorite from Trader Joes that is a whole grain mix. How you top your pancakes is what is most interesting to me. As a kid I slathered on lots of strawberry preserves on mine. I hated the pancakes getting soggy with the syrup. Still to this day I am not so fond of a soggy syrup soaked pancake. My lovely husband spent a fortune on some 100% pure maples syrup for me for a birthday gift. I smiled and said thanks, but all the time thinking “yikes, this stuff is really thin and will certainly soke a pancake quicker that anything!”. Today I am a fruit topping girl with a tiny bit of syrup. Maddy (my daughter and the light of my life) loves powdered sugar only on hers. French toast too… fruit and powdered sugar or just powdered sugar. Guess the apple doesn’t fall far from the tree!